Character Options Ted Glen’s Garage Playset includes an articulated Ted Glen Figure. 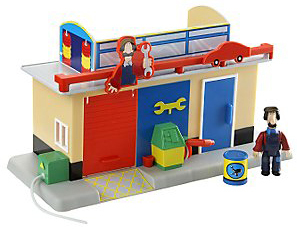 Ted’s Garage has a wind up petrol pump and air line which can be connected to Postman Pat’s SDS van. The garage door opens so you can drive a Postman Pat vehicle through. The playset even includes an oil drum accessory.